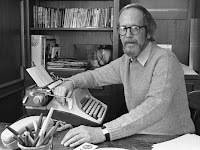 A Shroud of Thoughts: Elmore Leonard R.I.P. My book available on Amazon in paperback and Kindle editions. Elmore Leonard, the author of many crime thrillers and Westerns, died today at the age of 87. The cause was complications from a stroke. Elmore Leonard was born in New Orleans on 11 October 1925. He was nine years old when his family moved to Detroit, Michigan. Following his graduation from high school in 1943 Mr. Leonard served for two years in the United States Navy as a Seabee. Following World War II he attended the University of Detroit, from which he graduated in 1950. Afterwards he worked as a copywriter for an advertising agency in Detroit. Mr. Leonard wrote Westerns in his spare time and sold his first story, "Trail of the Apache", in 1951. His first novel, The Bounty Hunters, was published in 1953. In the Fifties he followed it with three more Western novels: The Law at Randado, Escape from Five Shadows, and Last Stand at Saber River. His short story "The Captives" provided the basis for the Bud Boeticher film The Tall T (1957), starring Randolph Scott, while his story "Three-Ten to Yuma" provided the basis for the Western classic 3:10 to Yuma (1957). In the Sixties Elmore Leonard wrote only one Western, Hombre, which was adapted into the 1967 film of the same name. In 1969 Elmore Leonard's first crime thriller, The Big Bounce, was published. It was adapted into the film of the same name the same year. In the Seventies Mr. Leonard wrote a mixture of Westerns and crime thrillers. Among his Westerns were Valdez is Coming, Forty Lashes Less One, and Gunsights. Among his crime thrillers were Mr. Majestyk (adapted into the 1974 film of the same name), 52 Pick-Up (adapted into the 1984 movie The Ambassador and the 1986 film 52 Pick Up), Swag, Unknown Man No. 89, The Hunted, The Switch, and City Primeval. The Eighties would see Mr. Leonard writing exclusively crime thrillers, including Split Images, Cat Chaser (adapted as the 1989 film of the same name), Stick (adapted as the 1985 movie of the same name), Killshot (adapted as the 2009 film of the same name), and Get Shorty (adapted as the 1995 film of the same name). The Nineties would see Elmore Leonard's last Western Cuba Librre, as well as the crime novels Rum Punch (adapted as Quentin Tarentino's film Jackie Brown), Pronto, and Riding the Rap (the last two, along with 2001's Fire in the Hole, would provide the basis for the show Justified). The Naughts would see the publication of such novels as Tishomingo Blues, Coyote's in the House, and Road Dogs. Elmore Leonard also wrote for film and television. He wrote the screenplay for Joe Kidd (1972) and the television movies High Noon, Part II: The Return of Will Kane and Desperado. Elmore Leonard was arguably one of the most gifted writers of the 20th Century. His style could perhaps be best described as "stripped down." He wrote with a minimum of description and with a concentration on dialogue. He eschewed adverbs entirely. Many believe that he transformed the crime thriller, removing its cliches and turning many of its cliches around. While he may now be better known for his crime thrillers, it is actually his Westerns I prefer. While other Western novelists and Hollywood seemed to be in love with the American plains, Mr. Leonard preferred to set his stories and novels in New Mexico and Arizona. His Western novels also tended to be grittier than those of other Western writers, often lending a film noir sensibility to the Western genre. Indeed, the classic film 3:10 to Yuma is fairly close to what one can expect in Mr. Leonard's Western novels and stories. Regardless, whether one is discussing his Westerns or crime novels, Elmore Leonard was one of the best authors of his time. Except where otherwise specified, all text © 2004-2019 Terence Towles Canote. All Rights Reserved. #10Years10Memories – The TCM Classic Film Festival 10 Years On. The Road to TCMFF 2019: Spellbound Awarded Official Media Credential! Do You Want More Rudolph Valentino in Your Life? The Retro Set | Cool. Current. Classic.